Where is the Colorado Plateau and why is it unique? The Colorado Plateau is centered in the southwestern United States, in an area termed the Four Corners region which extends into Colorado, Utah, New Mexico and Arizona. The following tribal nations govern the lands of over a third of the Colorado Plateau: Hopi, Zuni, Navajo Nation, White Mountain Apache, Hualapai, Havasupai, Ute, and Kaibab Band of Paiute. The enduring Native presence on the Colorado Plateau renders this region one of the world’s richest bio-cultural landscapes. The Colorado Plateau is also ground zero for industrial development and extractive industries that threaten land, water, and culture. This unique dynamic requires strong Native leadership, and the movements built by the Colorado Plateau’s Native communities scale to regional, national, and global levels. What is the Colorado Plateau Foundation? The Colorado Plateau Foundation is a Native-led foundation that supports the cultures, lands, and waters of the Colorado Plateau. The Colorado Plateau Foundation invests in Native-led organizations working in four priority areas on the Colorado Plateau – protection of water, protection of sacred places and threatened landscapes, preservation of Native languages, and sustainable community-based agriculture. What is the Colorado Plateau’s Foundation history? Jim Enote (Zuni) founded Colorado Plateau Foundation in 2012, in partnership with the David and Lucile Packard Foundation, Christensen Fund, and Arizona Community Foundation. The Colorado Plateau Foundation emerged to address a regional need for a bridge between the Colorado Plateau’s Native communities and the national philanthropic community in response to the lack of philanthropic dollars reaching rural, Native communities on the Plateau, despite both overwhelming need and the presence of established Native-led organizations who were leading transformative work. Our grantmaking priorities are informed by tribal leaders from across the Colorado Plateau. Through a series of inter-tribal gatherings, cultural and community leaders from Colorado Plateau tribes identified our four priority giving areas as requiring immediate and sustained attention. Who are Colorado Plateau Foundation’s partners? Philanthropic partners, both foundations and individual donors, are working with the Colorado Plateau Foundation to support Native communities. Our foundation partners include The David & Lucile Packard Foundation, The Christensen Fund, Entertainment Industries Foundation, Santa Fe Community Foundation, Swift Foundation, Arizona Community Foundation, and the Levinson Foundation, and Patagonia, among others. The dynamics on the Plateau are complicated, and our familiarity and understanding of the issues in the region helps funders understand the power of Native organizations to drive change. We share our theory of change with foundations and individual donors to help them better understand how tribal-driven work fits into their portfolio of giving and the relevance of Plateau work to the larger world. What is Colorado Plateau Foundation’s grantmaking approach? We value a culturally centered model of giving that meets grantees where they are at and then supports their growth into organizations capable of accomplishing sophisticated and positive change to protect the Plateau’s environment and cultures. We give capacity-building grants in amounts between $1,000 and $25,000 to organizations working in our four priority issue areas. Since 2012 we have given $1,200,000 to over 60 Native-led initiatives. Starting in 2018, we will begin granting for program support to repeat grantees who have built strong organizational capacity. Why is the Colorado Plateau Foundation needed? The Colorado Plateau Foundation’s approach begins addressing some of the philanthropic inequities on the Colorado Plateau. Less than .5% of national philanthropic dollars supports Native communities and Native-led initiatives. Of that amount, 74% is directed to urban initiatives, which excludes most of the vital work occurring on the Colorado Plateau. Moreover, 68% of philanthropic dollars intended to benefit Native people are granted to non-Native led organizations – disenfranchising the tribal leaders and communities conducting the work. 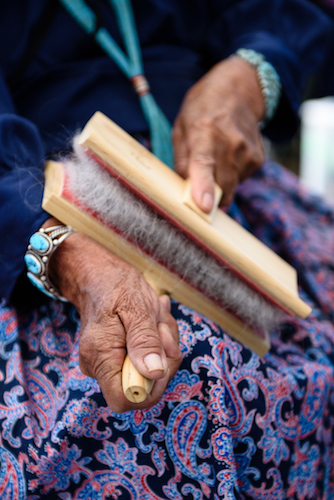 By directly giving to Native-led organizations and initiatives on the Colorado Plateau, the Colorado Plateau Foundation is supporting culturally-appropriate and culturally-grounded movements that have the potential to scale at a regional, national, and global scales.